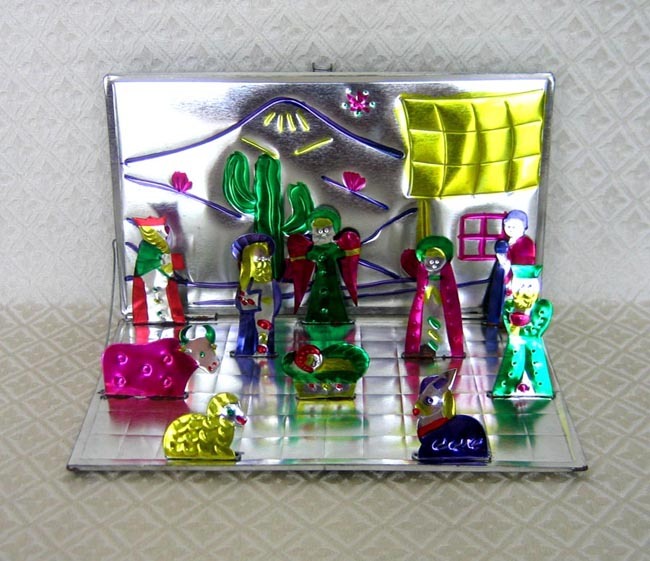 This thin tin box from Oaxaca, Mexico opens up to become a Nativity scene. When the box is opened, all of the figures stand up on the base. The figures include Mary, Joseph, Baby Jesus, an angel, three wise men, a donkey, a sheep, and an awesome fuchsia cow. The backdrop painted on the box depicts a mountain backdrop with cactus tree and house in the foreground. The box measure 9.5 inches by 5.5 inches. The figures measure up to 3 inches tall.